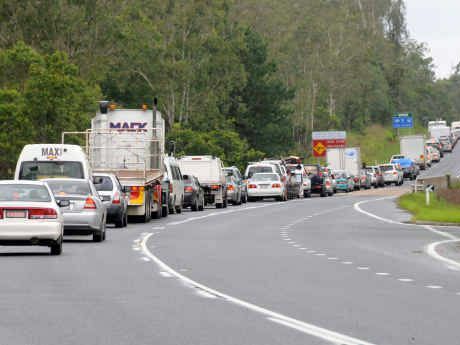 GYMPIE region motorists travelling on the Bruce Hwy south of Gympie could experience traffic disruptions as of next week, because of tree clearing as part of the Cooroy to Curra project. From next Monday, September 28, tree clearing works will be carried out in the road reserve area adjacent to the southbound Bruce Hwy lanes, between Mary River Rd and Bagnalls Rd. Federal Member for Wide Bay and Minister for Infrastructure Warren Truss said, weather permitting, the clearing should be completed within a week. "The work will be carried out during daylight construction hours of 6am-6pm, Monday to Saturday," Mr Truss said. "These clearing activities will allow for the commencement of early works that are required for the construction of the new southbound bridge at Six Mile Creek. "While this work is undertaken, stop-go traffic controls may be required intermittently on the highway between Mary River Rd and Bagnalls Rd. "While efforts will be made to minimise any disruption caused by the road works, I encourage motorists to consider adding some extra time to their journey, to allow for any delays," Mr Truss said. "I thank motorists for their patience and cooperation during the construction period."